Gross Weight (GVWR) 16290 lbs. For taking long distance trips together, your family needs a 5th Wheel that's comfortable, reliable, and built for years of fun! 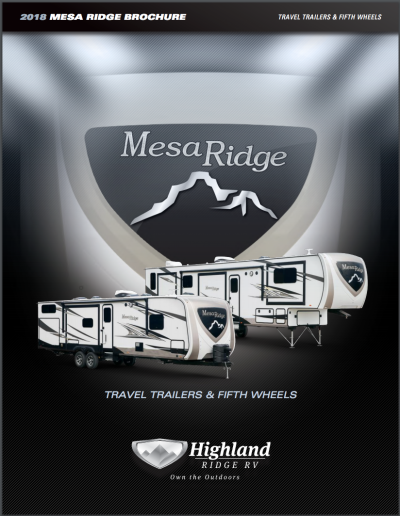 The 2019 Highland Ridge Mesa Ridge MF427BHS is the perfect RV for you! This superb model is now available at Tradewinds RV Center, known throughout Michigan and the nation as one of the top RV dealers anywhere, thanks to our low, wholesale prices, huge inventory of all the top brand RVs, and our courteous, professional, and knowledgeable staff! We're located at 4325 W Vienna Rd Clio Michigan 48420, so stop by and see us today, and you could be taking home your dream RV at a dream price! If you'd like more information about this great RV, call our friendly Mesa Ridge expert now at 810-686-0710! We've got fast, reliable, 24/7 delivery anywhere in North America! We'll show you how you can own this outstanding RV and save $1000s as well! One of the best features of this 5th Wheel is the 12' 0" patio awning that opens easily and lets you enjoy the fresh air, protected from the hot sun or the soaking rain! And with a hitch weight of 2290 lbs, this rig is easy to tow and set up when you reach your camping destination! You'll be ready to kick back in no time! Plus, the hefty GVWR of 16290 lbs. means the 2019 Highland Ridge Mesa Ridge MF427BHS can carry the whole family with no worries! The Mesa Ridge MF427BHS is 39' 6" long and 8' 4" wide. 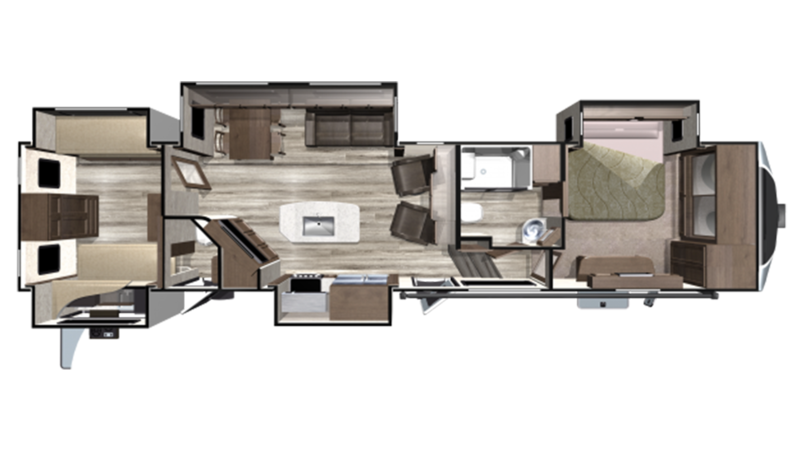 Together with the 5 slides that open up the interior, there's so much comfortable living space for your family in this 5th Wheel! When the weather outside turns cold, the efficient 35000 BTU furnace will keep everyone toasty, while the modern 15000 BTU a/c unit keeps the inside cool and comfy on those sizzling hot summer days. Up to 7 people can drift off to dreamland in absolute comfort inside this cozy RV! You'll sleep like royalty in the Queen bed of the master bedroom! You'll have a beautiful, modern kitchen with all the cooking appliances you need, including a 3 burner cooktop and a 8.00 cu. ft. refrigerator! With the 85 gallon freshwater tank, you won't run out of clean water anytime soon! At the end of every fun-filled camping day, nothing beats a great night's sleep so you can recharge your batteries for tomorrow. Luckily, there are comfy Bunkbeds in the bunkhouse! Kids or guests can ease off to dreamland every night, cozy and serene! You'll love the outdoor kitchen! It's easy to open and you'll whip up delicious, fun meals for everyone anytime you please! Great for picnics and tailgating!